I’ve been trying to get shots of this outfit for the longest of times. Seriously, I don’t think I’ve ever very-nearly-almost-but-not-quite’d so much. The frustration was real, because I fricking love all the components of this look and have wanted to share for ages. Off-the-shoulder is in full trend takeover right now. The bardot thing has always been a pretty romantic look when it’s popped up in the past, floaty chiffons and elasticated playsuits and pretty summer dresses. Then it got edgy with ribbing and cropping and the full stretch-cotton clinginess of the 90s revival. 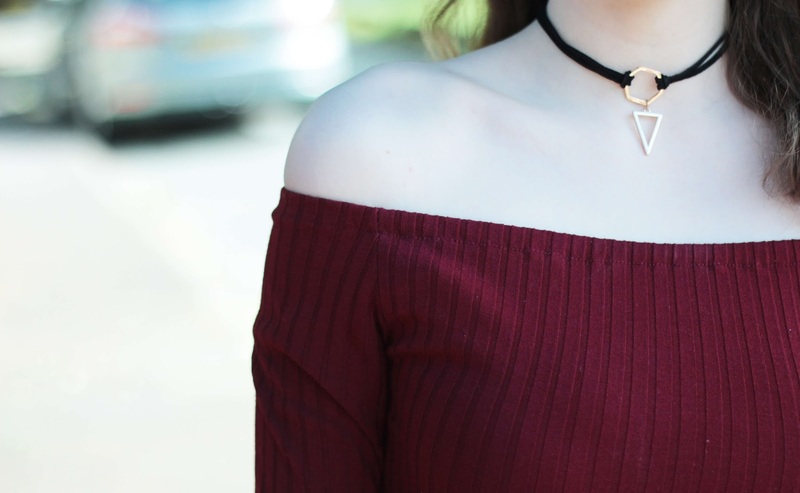 I was browsing the yesstyle page of one of the Korean brands I used to visit a lot when I was in Seoul – dabagirl – and came across this deep red/almost burgundy ribbed cold-shoulder top and thought ‘I’m having that’. It was reduced at the time too, so fab news for me. The shorts are a pair from missguided that I saw on the website and instantly fell in love. 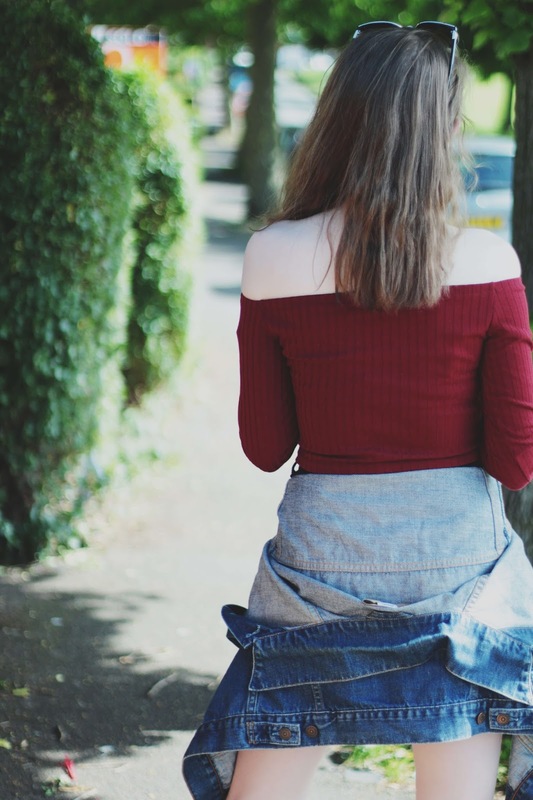 I’ve worn them a few times already on the blog so you’ve probs seen them around, but I really do love the high waist and the button fastening rather than a zip. They’re so versatile and go with absolutely everything. E v e r y t h i n g. I got them one size up so they’d sit oversized, and I can wear them with a belt to get a slight paper-bag style look at the waist. Seriously they’re a brilliant pair of shorts. LET’S TAKE A MINUTE TO TALK ABOUT THIS CHOKER. I am so in love with it. Geometric!!! Shapes!!! Interlocking things!!!! I’m all about the choker trend right now. I was never allowed to wear the plastic stretchy ones from Christmas crackers (that UO are now selling for like £10 a pop oh how times have changed) because my schools were really strict with dress codes, and I think by the time I was in year 6 they’d phased them out. So when they came back uh yeah I’m totally getting on board. Not the same stretchy plastic ones, but the leather(ette/esque) cord ones with pretty pendants/rings/hearts, the velvet ones, the ribbon ones, the all the ones plz. I saw this on aliexpress for under a pound, free shipping and immediately added it to basket. So glad I did. So pretty. 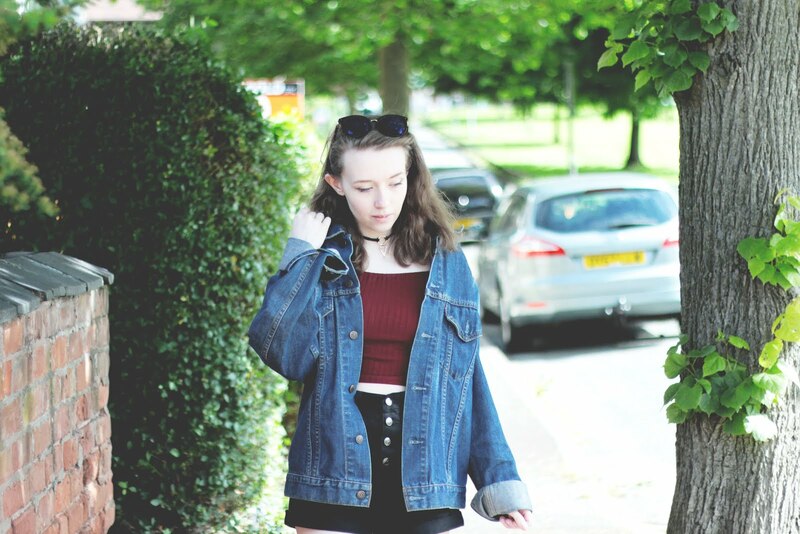 Touting the must-have-ness off a denim jacket yet again. But seriously. Seriously. Guys. Get on it if you don’t have one, they’re so frickin’ easy to style. If it’s a decent manufacture, they last for ages too. Like legitimately ages. Even my dad has whacked out his original Levi’s to wear a bit more now. I basically twin with my dad. True story. "(More!) Free Resources for Creatives"